Would you like to keep using JetPack’s new lazy load feature for non-gallery images but still use Envira’s lazy load for the gallery images? This tutorial will walk you through the steps needed to use both JetPack and Envira lazy load! This tutorial is a bit more technical than our other docs, but we’ll walk you through the process step by step. In order to make your gallery titles links, we’ll need to create and upload a basic WordPress plugin. Can I just disable JetPack’s Lazy Loading? Will this work for Envira Lite too? Your next step is to activate the plugin you just uploaded. 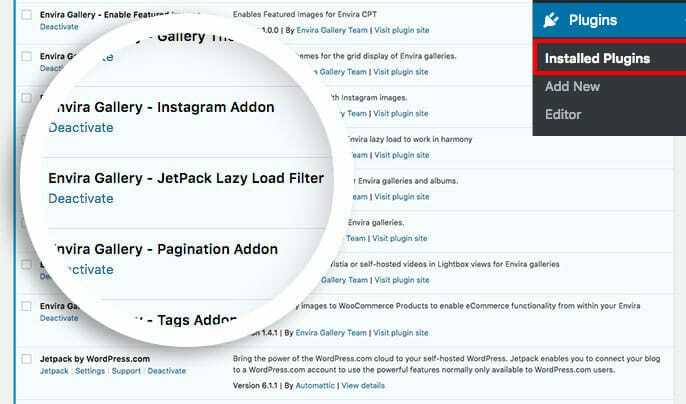 Simply navigate to the Plugins from within your WordPress dashboard and activate the Envira Gallery – JetPack Lazy Load Filter plugin. And that’s it! When you activate the plugin, you’ll be able to use both JetPack and Envira’s lazy load options. If you would like to extend Envira galleries in other ways, check out this tutorial on how to How to Track Views, Shares, and Downloads of Each Gallery Image. A: Certainly! Navigate to JetPack » Settings, under the Performance & speed you’ll have an option to turn the Enable Lazy Loading for images on or off. A: No, currently this is only for the Envira premium licenses. We’ll update this doc when Envira Lite has this filter capability in the near future.